As I’ve mentioned in my previous post, Kyan, Anya and myself have managed to secure a 10-year visa for the USA and we’re leaving this coming Friday 8 April for San Francisco. Until then, we’ve decided to visit Paris like, you know, tourists. I have to say that TripAdvisor has been very useful in helping us choose what to visit. For instance, today, I brought the kids to Sacré Coeur which is a beautiful church on a hilltop from which you can see see the whole of Paris. There were lots of clouds (and the temperature was around 15 degrees) but, still, Kyan and Anya were delighted. From Sacré Coeur, we walked through Montmartre and took the metro to Place de la Concorde. 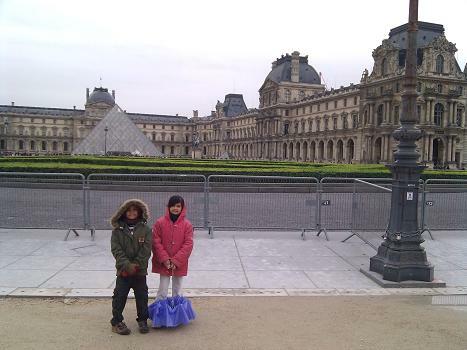 From there, we went through the Jardin des Tuilleries to the Louvre Museum. Along the route, we saw some magnificent gardens. The flowers were amazing even though spring has barely started. We decided not to visit the Louvre Museum because, on our way back from the USA, we’ll come back to France for a few days with Christina. We’re keeping the nice bits for her. Our small island is a great island with beautiful places and great things to do… like Paris. A lot of Parisians are in love with their city and will do everything to make it better. For example, Parisians make it a must to keep their city clean (despite the pigeons and the dogs…) and they are extremely corteous (everyone says “Bonjour” and “Merci” in Paris and all drivers stop to let people cross the road — it’s amazing). In Mauritius, nature has been generous to us except that, we, Mauritians (and this includes yours truly), are not really clean (in the sense that we don’t mind throwing our dhol puree papers everywhere) and we are not known for our courtesy (just watch the drivers). I was talking to my uncle who has been living in Paris for years now and he was telling me that those things need to be taught in school. I wholeheartly agree. Let’s cut half an hour of differentiation and integration and let’s teach people to be corteous and friendly to each other. Absolutely. It is sad to see and feel those type of conduct among the mauritians. But i have to add that a generous portion of Mauritians are more or less ok. Also besides the bad manners we possess, we behave in Faiseur D’Esprit and this is more than a vice that has to be corrected. I recently visited the Philippines. With, probably over 70 Millions inhabitants- the kind of reception that i receive is unbelievable. You are greeted by scores of employees when you enter any supermarkets or departmental store. The Pinoy some body from the Philippines speak gently will make you feel at ease and always put their tone down regardless. Philippines are very poor people. Even they struggle daily there is contentment in their hearts. That what we need. That’s true, Mauritius is a really beautiful country. The only thing that is missing is the courtesy around and the respect towards each other and the environment. that’s the same feeling i got when in denmark :p people lacks courtesy and doesn’t care about their environment here. A lot of Parisians are in love with their city and will do everything to make it better. For example, Parisians make it a must to keep their city clean (despite the pigeons and the dogs…) and they are extremely corteous (everyone says “Bonjour” and “Merci” in Paris and all drivers stop to let people cross the road — it’s amazing). Bonjour and Merci are mandatory parts of a conversation in France. The French will be annoyed if one does not initiate the conversation with “Bonjour” when asking for information. I have read quite a few articles claiming that the French people are rude when tourists asked them for information on the streets. I don’t think these articles are telling the whole story. For example, if you are in Canada (outside of Quebec) and you need to ask someone for directions, you are expected to ask in English. The same thing should apply in France. However, very often, people expect the French person they are talking to to understand English. Personally, I don’t expect everyone in China to understand English. I have not had any bad experience when needing information/directions in France (Annecy, Grenoble, and Paris). That said, I have had a motorcycle passed in front of me while crossing the street and the lights were green for me. … we are not known for our courtesy (just watch the drivers). I agree that courtesy should be taught in school. After having spent ten years in Canada, I can tell you that there is huge difference between Canada and Mauritius. A couple of years ago I got the perfect example. Here, if you are walking on the street and happen to bump into another person, the immediate reaction would be for both person to say, “Sorry.” What I saw in Mauritius was different. Both men turned around, and looked at each other with an angry look on their faces. I do think that one will live longer and lead a healthier life if one does not get angry for nothing for anger create stress. Life would be much better if one can say sorry or hi or thank you. I believe teaching mannerism may help. But, will we be able to conquer our impulse? Frenchmen, Canadians and Thais (the best!) seem to be able to do it. Courtesy exists and the lack of it has some fair degree of occurrence. Civic rights, education, protection of the environment are indeed taught in Mauritius in many ways, but no one really follows it, because people simply don’t care. Check port louis streets, bushes in any town/village for proof; you have to spot at least one plastic bottle or a chocolate paper in them. If the parents do it, the kids will do it too… saw adults throwing their kids mess out of the bus window a lot of times while travelling! Also, what I have noticed in other countries is that there are bins at every corner of any road. Did you ever notice, that there are no places to dispose stuff in Mauritius? I usually have to walk a lot before finding at least one bin to throw away my empty snack packs. hygiene is definitely not part of our mauritian culture …! (and awesome post by the way).. but who will change that? the minority who agree with your post? People in mu seems more concerned with people in politics, horses, lotto than hygiene, resources, economics and our future.. ;) my 2 cents.. When I was very young (under 10 years), it was very common to see someone throwing garbage out of a car. I was told to do it by my parents too. Everybody did it at the time. Then, when I went to college, my principal said one thing during the morning assembly, “Do you do the same thing in your home?” This did it for me. Definitely and added to it is POWER whether Political or Economical?? ?